The best way to get to know a community is by scheduling a tour. See the facilities, meet the staff and residents, and get a feel first hand what it's like to live at Cherry Creek Village Independent Living. Whether you consider joining Cherry Creek Village because of our affordability, the first-class amenities that support your interests or want to live amongst other active seniors, we promise you won't regret your decision to join our community. And our proximity to downtown Attalla means all of life's necessities are just a short walk away. Cherry Creek Village is an independently owned and operated senior retirement community. We strive to create a community where our residents are comfortable, happy and are proud to call their home. 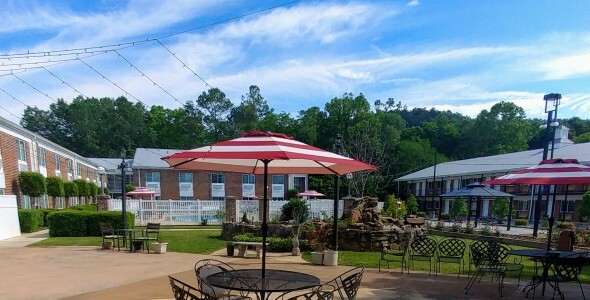 A outdoor swimming pool, an activities room and library - not many people can say their current home has these features, but at Cherry Creek Village, all our residents can make this claim. Our community also hosts numerous activities to fill the day and have you laughing with friends. Favorite activities include pool tournaments, karaoke and cooking classes. You can choose from spacious apartments in a studio, one- or two-bedroom layout - and all the comforts of home are included. A kitchenette, views of the landscaped grounds and closets are standard features. For added peace of mind we also offer an emergency medical pendant. Newcomers to Cherry Creek Village will quickly feel at home and make new friends, thanks to the many social events planned by our activity director. Our community also has gathering spaces where you can easily host family gatherings or celebrations. Services we provide to make your life just a bit easier include restaurant-style dining, weekly housekeeping and scheduled transportation for errands and appointments. Bill paying is a responsibility of the past since your monthly rent includes all utilities, free Wi-Fi and local telephone service. When supportive services are needed, you can request in-home care services from local providers. An affordable lifestyle that frees you from the responsibilities of home ownership is found at Cherry Creek Village.